If you feel like you can’t wait until summer, or you’re just fed up with the cold, you’ll absolutely love springtime in Barcelona! There are many various programs in this huge city in the following months, don’t worry you won’t ever feel bored while you are there. Let’s see what you can do here before pub crawl time! La Diada de Sant Jordi – 04.23. La Diada de Sant Jordi is basically the Barcelona version of Valentine’s Day. This day, also known as El Dia de los Amantes – The Lovers’ Day – is originally dedicated to Sant Jordi, the patron saint of Catalonia. As the legend says, he slayed a dragon, and from the dragon’s drop of blood a rosebush grew. That’s why you’ll find rose stands everywhere in the city, along with book stands as well. Why the books though? Well, the 23th of April is also World Book Day since 1995. Give a rose or a book to your S.O. Or your friend. Or your mom. You’ll find the appropriate colors (or books) for every situation. La Feria de Abril – 04.27-05.06. Don’t forget to visit Parc del Fòrum if you’re in Barcelona on these days! La Feria de Abril (a.k.a. The April Fair) will surely give you the Andalusian spirit you’re longing for. Different kinds of traditional foods, drinks, dancers – like, professional flamenco dancers to be more specific – and a huge amusement park for the children to have fun. Or is it just for them…? La Nit dels Museus – 05.20. On the 20th of May, several museums and other tourist venues will be open in Barcelona from 7 p.m. to 1 a.m. It’s gonna be a very exciting night indeed, with diverse programs and famous artists and museums – for example, the Picasso Museum is one of the venues that participates in this event! We can’t promise that dinosaur skeletons will come to life though… But surely you’ll have a great night if you’re up for some fine arts! Primavera Sound Festival – 05.28-06.03. 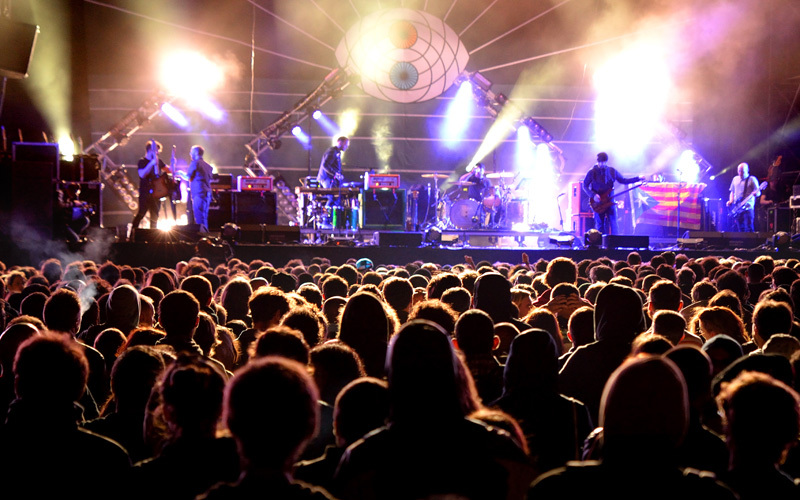 Summer in Barcelona starts with Primavera Sound Festival, and it also perfectly closes the wonderful spring season. Primavera is five days of classic Catalonian fiesta time, hanging out on the beach and listening to the coolest bands (and buskers) from around the globe. Check out their official website for more details!